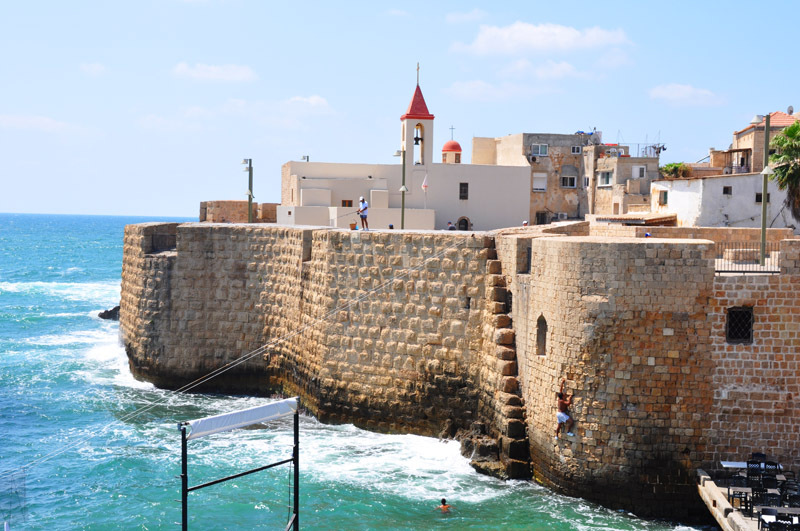 Acre (also Akko) is a city in the Western Galilee region of northern Israel. It is situated on a low promontory at the northern extremity of Haifa Bay; Acre had a population of 46,000. Historically Acre has been regarded as the key to the Levant due to its strategic coastal location. We shall begin the tour going up on Akko's northern city wall. It is possible to go up with steps, designed for that purpose. Right after the bridge that covers the ditch on Weizmann Street. In this location the Turks broke the city wall in the year 1910 and so, easy accesses to the city were created. After approximately a 100 meters east on top of the city wall and a bit downhill that leads to an indoor passageway for storage and soldier quarters, and from it the exit to the biggest most protected tower in Akko, from this direction Napoleon tried to break into Akko and due to Napoleons attempt Jasar Phaha, after Napoleons retreat, formed the most state of the art type protection, making it a fortress. From here we will continue on the eastern wall heading south. The wall was formed by Jasar Phaha from the year 1801. 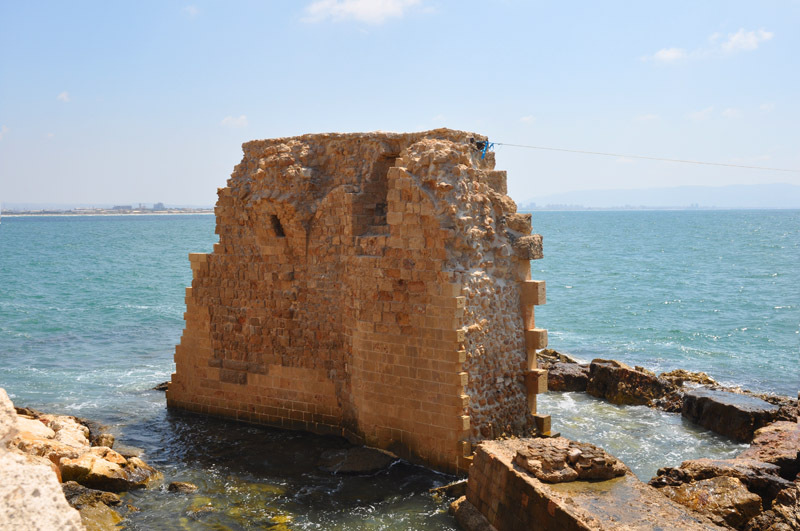 From it you may see the former wall (1750-1751) that was formed by the Bedouin ruler of the Galil Tahahr Alomar that decided that Akko is the capital of his ruled region and in the middle of the 18th century he formed the first line of walls of the new era. On the wall today there are a few cannons and old grenade launchers that are nicknamed "Napoleon's Cannons". In fact they have nothing to do with Napoleon or the Napoleon siege on the city. We will progress towards along the wall until we get to two guarding chambers and an observation post. This is a beautiful observation point of the city of Akko; the sky line is drenched with the tops of mosques and church towers. We will go down from the guarding post on the steep and terraced road that once was used to carry cannons to their positions. We will head south, towards the "Sha'ar Hayabsha " (the land gate) of the city that is located at the end of Tzlach A-Din Street. Up until the year 1910 this was the only gate of the land wall protecting the city of Akko. Above the gate there is an arch made of marble. At the gate the two original heavy wooden doors, metal plated and bolted with a huge lock have survived. Above the gate on top of the eastern wall there is a tower by the name of "Kapo Boreg". 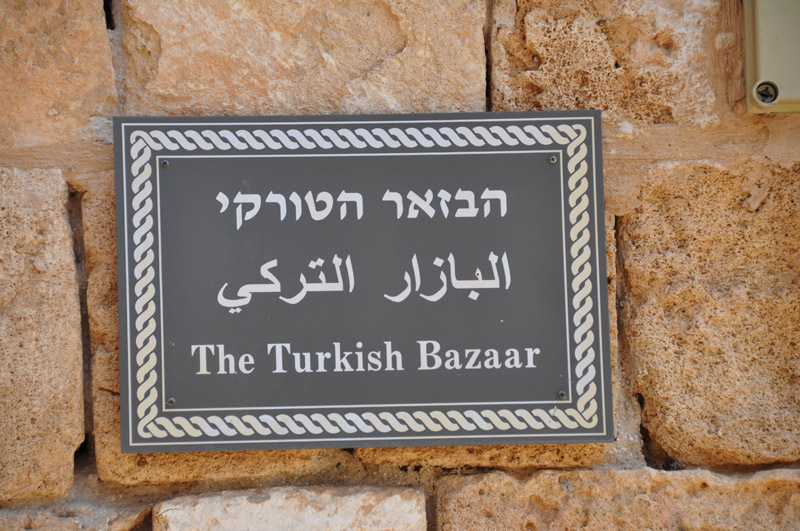 Over the gate begins the Tzlach A –Din that continues to the heart of the city of Akko. Through the shops and workshops. We shall walk this street up west until we get to the white market (Suk Alabis). 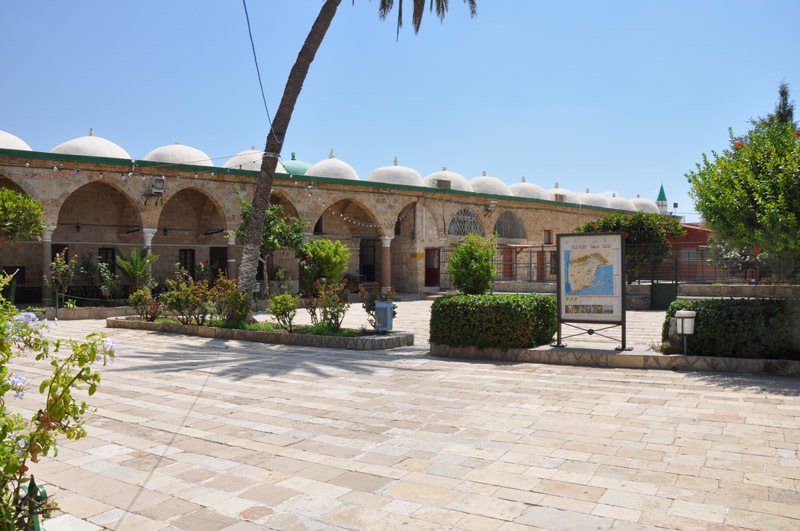 That was built by Tahar Ach- Omar, was destroyed in a fire and reformed by Suleiman Phaha in the year 1817. 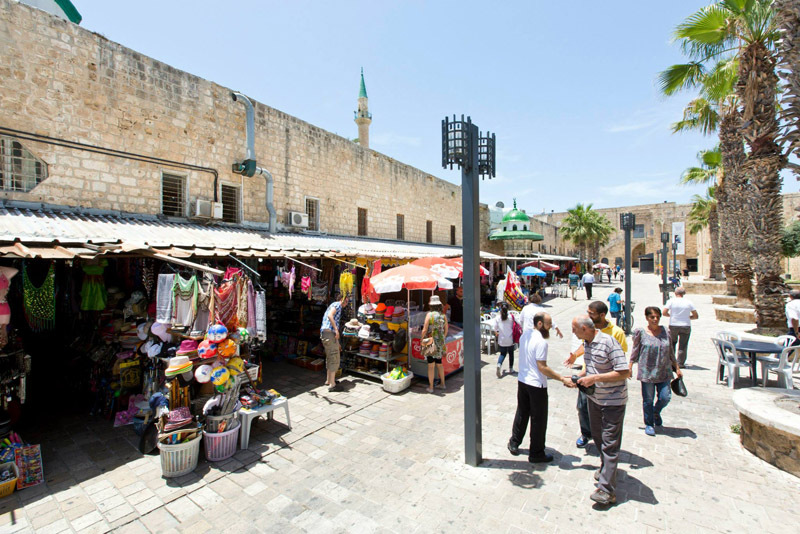 The market had a significant importance back in the day, because the only entrance to the city back then was via the eastern gate during the Turkish period and the market was a passage way to the mosque and the fort. After the wall was breached from the north, in the year 1910 the land gate lost its appeal and so did the white market. 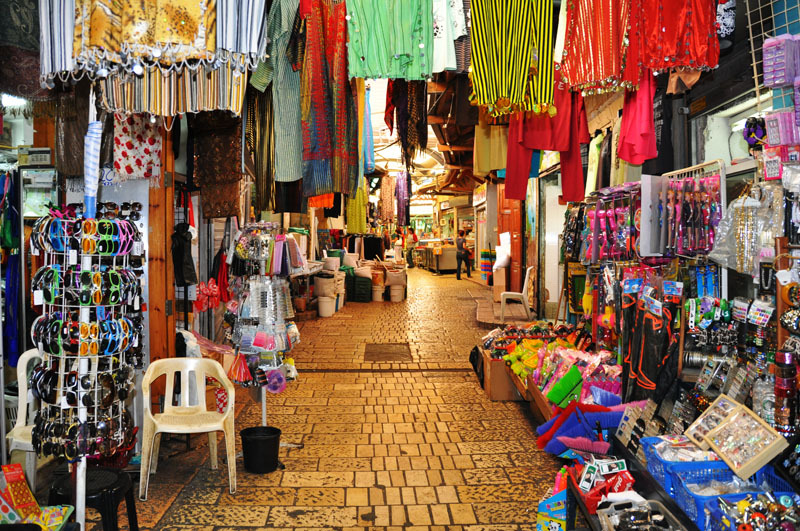 After the foundation of the state of Israel the market completely fell apart and the shops became workshops and storage facilities. At the end of the market , while heading west we shall arrive close to the El Jasar mosque that is named after its builder Jazar Phaha, that was completed in the year 1781 in the style of the common mosques in Turkey. 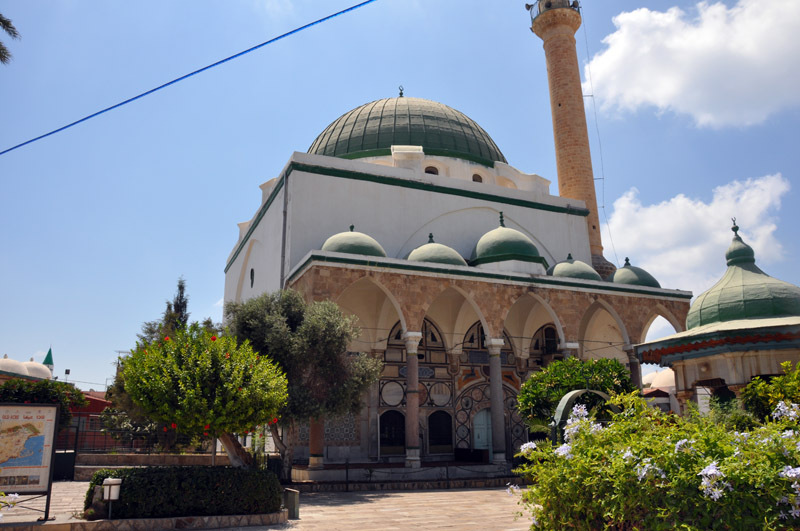 The mosque has a green dome and a high pointy tower, the mosque is surrounded by a large garden (entrance to the mosque requires a fee) in front of the entrance to the Jasar mosque we will take notice of a large floor space and the entrance to the local post office branch. 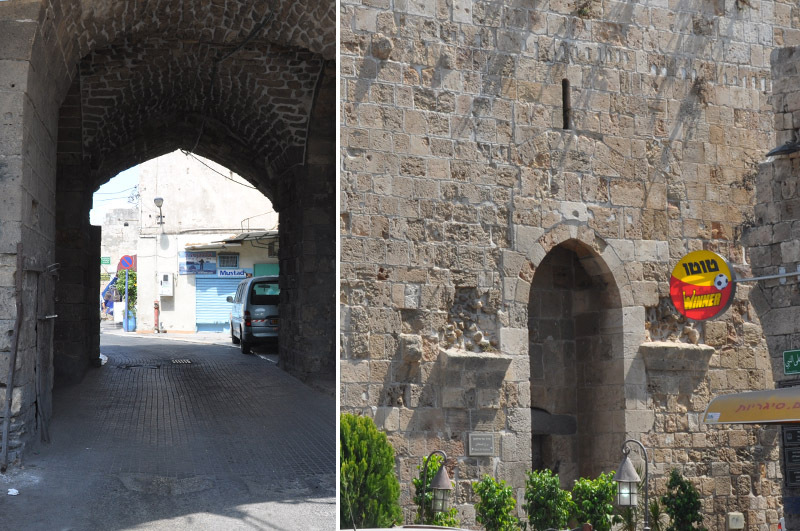 This is also the entrance the crusaders Akko. On our tours we will not enter the crusading sites of the underground city but we will proceed down the El Jazar street south where we will encounter an entrance sign to an Arab elementary school (Mamlachti aleph). The building was formally known as "A- Sraya El Atika" (the house of the local government) the school's gate is highly decorated with bright and dark colors. We will surround the school's structure and head south. In alley number 012 during our decent down the steps to the right we will notice the entrance to the Akko city museum (entrance requires a fee) here also there is a bridge that connects the schools to the museum's structure. On our left in front of the museum we will see through steel gates that close the underground passage ways of the crusaders city. We will continue down the alley south and we will spot a reformed indoor market. This is "the long market" or "the Turkish bazaar" that surrounded the El Jasar mosque compound from the south and from the east. The market is generally for fairs and exhibitions. From the bazaar we will continue south till the end of the alley. We head out towards a major square and on its shoulders is a very impressive mosque with an old castle and two domes. 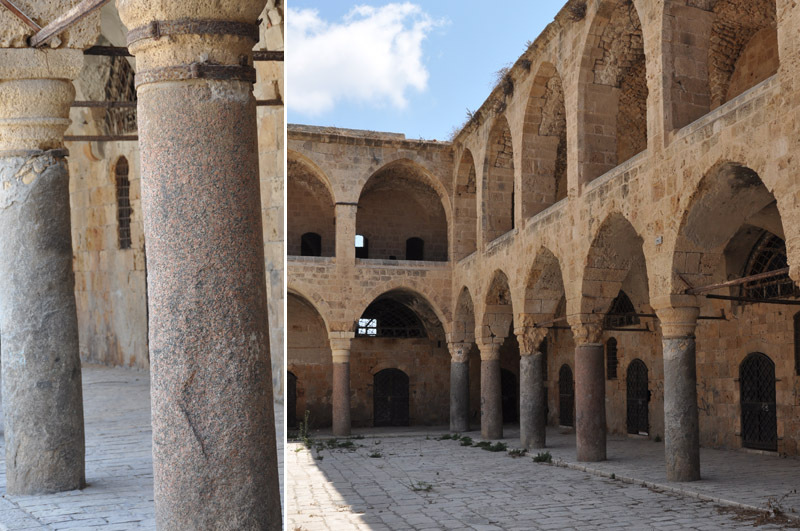 The A-Zetona mosque, which is probably the oldest of the Akko mosques. On the side of the garden is Shiqe Husain Abed El Hadi's grave. When he reformed the mosque. We will head south down alley number 013 as we go through the shoulders of the market in its decent south, this street corners with the Almphi street. In this corner of the two street signs we shall head to the east. In about a few meters we shall stand in the doorway of the prettiest of Hans – Han El Omdan (The Poll Han) that was built by Jazar Phah in the year 1784. Han El Omdan is built two stories high that surround a large garden. The upper floor was used for the merchants and mediators quarts, while the lower floor was used for storage. The live stock was left out for the night time in the Han's garden. We shall end the tour in the fisherman's port that was created due to the closing of the bay on both docks. The western one of them was pulled into a sort of sea wall south up till it got the small island, where it was built upon even back in the Fenwick days –a fortress called the "Fly tower". This is the places crusade name that is given to him due to its false ID of the biblical Akko by the crusaders, a temple of "Lord of the Flies ". The Templar's Tunnel in the old city.